Climate, indigenous rights, and water security are all at stake in the ongoing fight against Enbridge’s tar sands pipeline. A demonstrator outside the Minnesota Public Utilities Commission during deliberations on Enbridge's Line 3 to carry tar sands crude across the state, St. Paul, Minnesota, June 28, 2018. Last June, the Minnesota Public Utilities Commission approved a crude oil pipeline that would cross northern Minnesota through some of the state’s cleanest waters. Proposed by Canadian energy giant Enbridge Energy, the line would move 760,000 barrels per day of tar sands crude from Alberta to a terminal in Superior, Wisconsin, to be made available to foreign markets. As a Minnesota resident and Sierra Club volunteer opposing Line 3, I was deeply disappointed by this commission’s decision. But efforts to stop the project are far from over. Line 3 opponents are suing to overturn the approval in the Minnesota Court of Appeals, and challenging the state and federal permits that Enbridge needs before it can begin work. The construction would replace an old, and failing, Line 3 with a new and larger pipeline running 337 miles from Minnesota’s northwest corner to an existing Enbridge terminal in Superior, Wisconsin. 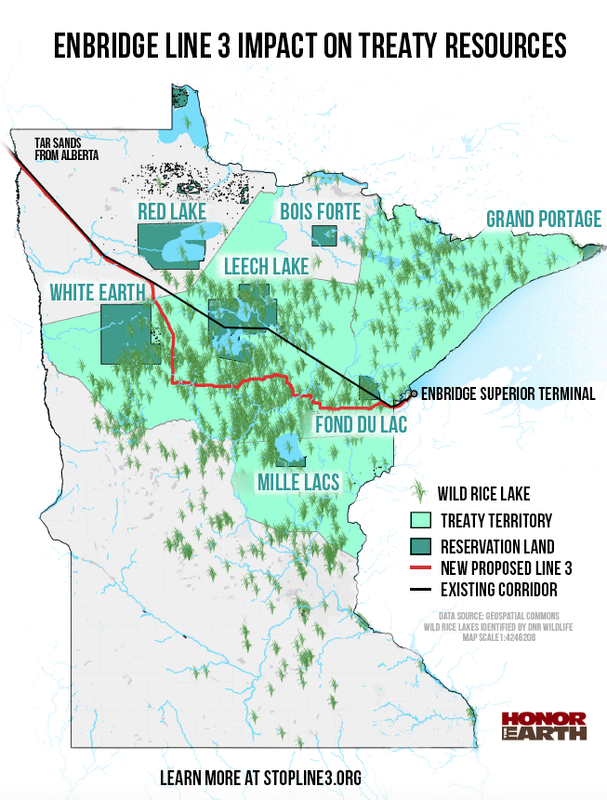 Portions of the new Line 3 would be rerouted to avoid crossing the Leech Lake Reservation, due in part to indigenous opposition. The reroute also allows the company to continue using the old line during construction of the new. A multi-agency task force has been stockpiling equipment and training police in preparation for Line 3 pipeline protests in coordination between law enforcement agencies from Minnesota, Nebraska, North Dakota, and South Dakota. Resistance to Enbridge’s plans has included packed public hearings, as well as rallies and protests along the route and in the Twin Cities. Dozens of opponents have been given citations and arrested for direct actions at construction sites. This has been particularly true in Wisconsin, where Enbridge built a short Line 3 segment from the Minnesota border to Superior. According to The Intercept, Minnesota law enforcement is gearing up for a major standoff over Enbridge Line 3, including a coordinated effort to identify potential anti-pipeline camps and monitor individual protesters, repeatedly turning for guidance to the North Dakota officials responsible for the militarized response at Standing Rock in 2016. Meanwhile, as the website Unicorn Riot has reported, a multi-agency task force has been stockpiling equipment and training police in preparation for Line 3 pipeline protests across the state. Documents show coordination between various law enforcement agencies from states across the region including Minnesota, Nebraska, North Dakota, and South Dakota. Minnesota Administrative Law Judge Ann O’Reilly has overseen much of Line 3’s lengthy case hearings, a quasi-judicial process to gather expert testimony and hold public hearings. In April 2018, she issued a 436-page report. She concluded that among the route options presented, the only way the costs would outweigh the benefits would be if Enbridge rebuilt Line 3 along the existing route. The Minnesota Public Utilities Commission’s decision departs in significant ways from O’Reilly’s report, forming part of the basis for legal challenges currently before the Minnesota Court of Appeals. The Red Lake Band of Chippewa, the White Earth Band of Ojibwe, Honor the Earth, and the Sierra Club filed a joint appeal. Separate appeals have also been filed by Friends of the Headwaters, the Minnesota Department of Commerce, and the Youth Climate Intervenors. But such a contention ignores that not all energy sources have the same environmental impact; tar sands oil is among the absolute dirtiest ways to address energy needs. The project also poses its own significant risks for the environment. Line 3 would run under the Mississippi River twice, including at the headwaters region. It would cross 211 streams and seventy-eight linear miles of wetlands, according to Enbridge documents. Indigenous communities are especially concerned about oil spills damaging wild rice beds. O’Reilly, the administrative law judge, recommended against Enbridge’s preferred route, saying the company had failed to show the benefits outweighed the costs. The Minnesota Department of Commerce also argued that Enbridge failed to prove the pipeline was needed, a key first step for considering the project. The proposed Line 3 route also conflicts with treaty rights. It would cross land ceded by the Anishinaabe people (Ojibwe and Chippewa) to the U.S. government, but on which various bands claim treaty-protected rights to hunt, fish, and gather. The U.S. Supreme Court case, Minnesota v. Mille Lacs Band of Chippewa Indians sets a precedent for such a claim. With legal challenges pending, Enbridge still needs several state and federal permits before it can start building, including water crossing permits from the Minnesota Pollution Control Agency, which says a final decision isn’t expected until late October. Canada is seeking to increase crude oil exports to foreign markets but lacks the pipeline infrastructure to make this happen. Line 3 is a critical link. With all the delays, Line 3 won’t be running until mid-2020 at the earliest. And this presents a big problem for Canada, which is seeking to increase crude oil exports but lacks the pipeline infrastructure to make this happen. TransCanada’s Energy East pipeline would have linked the Alberta oil fields to refineries all the way to New Brunswick. It was scrapped in 2017, though efforts are underway to revive it. Enbridge proposed building the Northern Gateway Pipeline from Alberta to British Columbia. That failed to get government approval. Kinder Morgan tried to build the Trans Mountain pipeline, also from Alberta to British Columbia. When it stalled in the face of public opposition, the government of Prime Minister Trudeau bought the pipeline in 2018 to try to move it forward. The courts blocked Trans Mountain last fall. But Canada is not giving up. Amarjeet Sohi, Canada’s minister of natural resources, met this month with U.S. Secretary of Energy Rick Perry in Houston to discuss ways to make both TransCanada’s Keystone XL project and Enbridge’s Line 3 replacement pipeline a reality. Meanwhile, in Minnesota, Line 3 is testing newly elected Democratic Governor Tim Walz’s ability to navigate difficult political waters. The project, which Enbridge says would create 8,600 jobs over two years, including 4,200 union construction jobs, is backed by the Laborers District Council of Minnesota and North Dakota. Scott Russell is an independent journalist who lives in Minneapolis. He co-chairs the Beyond Oil and Tars Sands Committee for the Sierra Club’s North Star Chapter. It's sad that climate change is not enough to convince people how wrong this is. It's even worse as an Indigenous person because of the FACT that when those Treaties were signed, it gave tribes exclusive rights and also made Treaties Supreme law of the Land, meaning Tribes hold jurisdiction over those agreed upon boundaries. Buying your way through, across, under or over is not okay. What makes violating American Indian rights okay? Forcing people at gun point to accept environmental destruction is a human rights violation. Greed is the driving force behind these corporations and they will spend endless amounts of money to convince the public that it's needed. All lies. It's time people respect what has been given to us, Life. Without Water we are as good as dead. When will these crazy conservatives stop destroying everything we need to live? It really shows how ignorant people can be when the fact that our Tribes Treaties can be tossed aside like they don't exist for a foreign countries interests. Thanks for showing us what our rights and laws mean to this State. I would also like to say Chi-Miigwech to Governor Tim Walz and Lt. Governor Peggy Flanagan for standing up for this state and for the Indigenous people of this state. Thank you for not giving in to greed and cowardice as some of their other co-workers have done. I pray that someday people will stop with the hatred for my relatives and respect who we are. I pray for those who have that hatred in your heart for Indigenous relatives, I ask that understanding and love be shown to you and your family and someday you will have a different view of who we are. We just want to live too. Why is that so hard to accept and understand?